Soy bean is a rich source of protein and a must for the vegetarians. This is because vegetarians are found to get lesser amount of protein compared to the non-vegetarians. But including soy beans and their products in your daily diet is sufficient to provide you with all the protein that you need. Even meat eating people may consume soy beans and enjoy its benefits. Omega 3 fatty acids are essential for a healthy body and are found in high quantities in algae and fish. Soy oil is also rich in omega 3 fatty acids. So those who do not want to take fish products and algae may consume soy oil in order to get enough omega 3 fatty acids. Soy bean oil is small in structure and is a rich source of vitamins. Because of its small molecular structure, the oil can penetrate through the epidermis and dwell in the cellular structure, thus stimulating the production of collagen and elastin along with other proteins. This property of the soy oil aids in cell growth and also reverses the formation of abnormal cells. Soy protein is a good substitute for meat proteins and therefore vegetarians get whole proteins by consuming soy proteins regularly. This is also proved by the researches done by US Food and Drug Administration. In fact, they are more beneficial than animal protein because animal proteins contain more fat, especially the saturated fat. But soy protein does not contain excess fat. 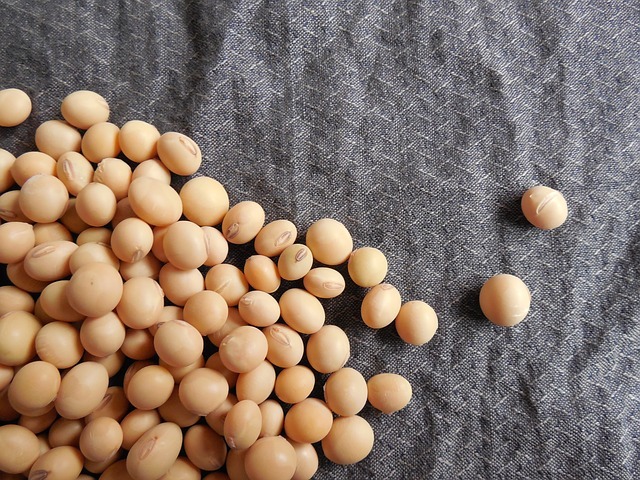 Moreover, soy beans contain amino acids, which play an important role in the production of insulin. The level of bad cholesterol called LDL cholesterol is greatly reduced by having at least 4 servings of soy protein daily. It is estimated that the level of LDL cholesterol is reduced by about 10%. At the same time, it do not affect the production of good cholesterol in the body. This keeps ypu healthy and protects you from various diseases. Soy proteins are rich in amino acids that may be found in tofu and soy milk. These amino acids are converted in to energy inside the body. Although it is said that women are more prone to weak bones, even men suffer from weak bones and other related problems. They are greatly benefited by consuming soy regularly. Soy products help you to have strong and healthy bones and also reduce mineral loss from the body. The occurrence of arthritis is also lowered by consuming soy beans. It is found that many new born infants are not able to digest breast milk and even the regular formula. Under such conditions soy milk may be used as a substitute. When such children are old enough to have solid food, other soy products may be added to their regular diet to keep them healthy. Phytoestrogens present in soy protein plays the role of estrogen and prevents severe bone loss. It also helps you to have a healthy heart. In postmenstrual women soy proteins help in providing stronger bones and maintain the calcium balance in the body. Soy protein is beneficial in losing weight and controlling hyperglycemia. Diabetes is another problem that is faced by many people. By including soy beans in your diet, you can not only lose weight and control obesity but also keep the level of the sugar in the blood balanced. So, diabetic patients must consume soy bean regularly. With its property of lowering the LDL cholesterol level in the body, it also lowers the risk of hart diseases in people. So, in order to have a healthy heart you must include soy protein I your daily diet. This not only reduces the level of cholesterol in your body, but also provides you healthy veins and maintains a good flow of the blood through the veins in to the heart. Pregnant women are highly recommended to consume soy products because of their various health benefits. Unlike other dairy products, fortified soy milk is rich in Vitamin D. vitamin D is necessary for strong bones in the child as well as the mother. Another way to get Vitamin D is by spending sometime in the sunlight. So if expectant mothers do not have enough time to stand out and get the sunlight, they can have soy milk instead. Skin care products that contain soy make the skin tone even and also reduce the occurrence of pigmentation caused due to exposure to the sun or due to change in hormonal activity. Soy is also a rich source of Vitamin E and fatty acids and lecithin, which are excellent for the skin. Soy also aids in regeneration and healing of the skin because of its antioxidant properties. The risk of prostate and breast cancer is greatly reduces by consuming soy bean products because of the presence of Genistein-phytochemicals in them. Genistein retards the growth of tumor cells and prevents cancer. Consuming 1 cup of soy milk or half a cup of tofu is enough to prevent cancer. Even soybeans are useful in reducing the risk of cancer. With advancement in age and hormonal problems osteoporosis is common in many women. The phytoestrogens present in soy aids and increases the absorption of calcium by the body and help in maintaining healthy and strong bones. Soy milk fortified with extra calcium and Vitamin D gives the best results. Various serious health problems are prevented by the intake of soy protein. Is is useful in preventing colon cancer cells, prostate cancer and also cures osteoporosis. Now that you have seen the amazing benefits of soy protein, include it in your daily diet and remain free from various diseases.